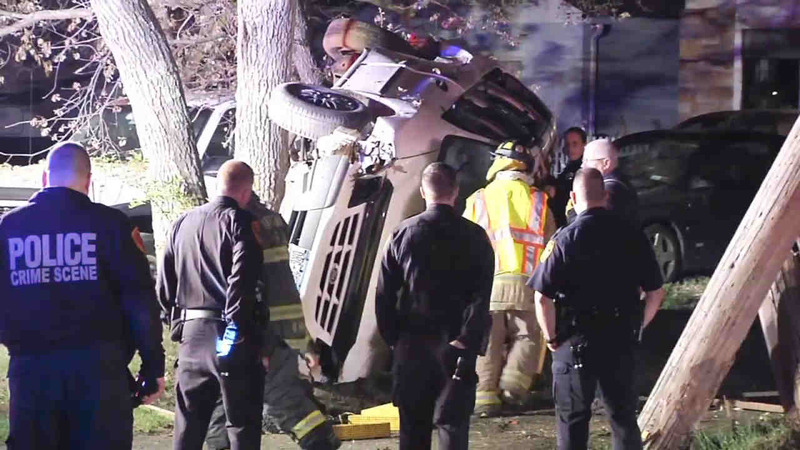 FARMINGVILLE, Long Island (WABC) -- A speeding driver, who police said ran a red light in Farmingville, crashed into a pole and overturned Wednesday morning. The driver lost control at Horseblock Road and Liber Boulevard at 12:30 a.m. According to the Suffolk County Police Department, he was trapped inside his vehicle and had to be extricated. He was taken to Stony Brook University Hospital with non-life threatening injuries. The man, who has not been identified, will be charged with driving while intoxicated. Suffolk police said officers think they previously attempted to pull the vehicle over in Mastic for driving without lights. The officers pursued him "for a short time" before they were told to break off the attempt to stop the vehicle.